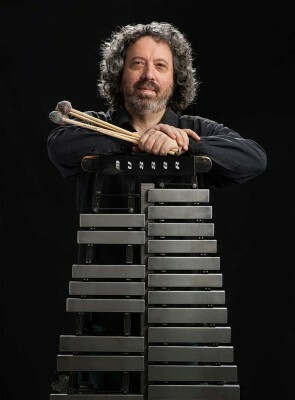 Tony Miceli is a legendary vibraphone player who has been performing in the United States and Europe through much of his career. He has played in countless jazz and percussion festivals, concert stages, jazz clubs and colleges with numerous artists including Ken Peplowski, Gerald Veasley, Diane Monroe, John Blake, John Swana, Joe Magnarelli, Steve Slagle and others. A resident of Philadelphia, recordings include a self-titled compilation CD, Looking East with the Philly 5; On a Sweet Note with Gerald Veasley and the Electric Mingus Project; Band Shapes with French pianist Olivier Hutman; Monkadelphia; Music From the Inside Out, a companion CD for the documentary showcasing the Philadelphia Orchestra, Concord Jazz recording artist and guitarist Jimmy Bruno; excerpt this! with Adam Unsworth, French hornist with The Philadelphia Orchestra; and, Thelonius 4 Meets Tony Miceli. Tony conducts master classes at the world-renowned Curtis Institute of Music and gives private instruction. He is on the faculty at University of the Arts and Temple University. In addition Tony runs a website www.vibesworkshop.com which is an online school of music for the vibraphone and boasts over 3000 members. He serves as a consultant to music and arts organizations.